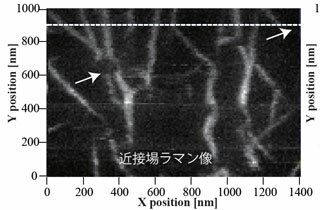 TERS(Tip-Enhanced Raman Scattering) imaging and spectroscopy of carbon nanotubes. 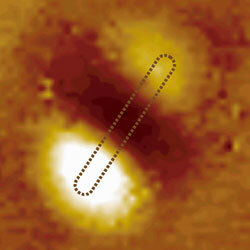 Time-resolved imaging of plasmon oscillation in a single gold nanorod. 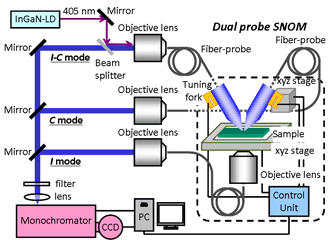 Dual-probe near-field scanning optical microscopy. Near-field optical microscopy using a phase-change mask layer. 1) T. Saiki and K. Matsuda, “Near-field optical fiber probe optimized for　illumination-collection hybrid mode operation”, Appl. Phys. Lett. 74, 2773 (1999). 2) N. Hosaka and T. Saiki, “10 nm spatial resolution fluorescence imaging of single molecules by near-field scanning optical microscopy using a tiny aperture probe”, Opt. Rev. 13, 262 (2006). 3) T. Fujii, Y. Taguchi, T. Saiki, Y. Nagasaka, "Fusion-spliced Near-Field Optical Fiber Probe Using Photonic Crystal Fiber for Nanoscale Thermometry Based on Fluorescence-Lifetime Measurement of Quantum Dots", Sensors 11, 8358 (2011). 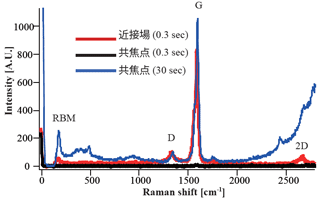 4) N. Hayazawa, T. Yano, S. Kawata, “Highly reproducible tip-enhanced Raman scattering using an oxidized and metallized silicon cantilever tip as a tool for everyone”, J. Raman Spectroscopy 43, 1177 (2012). 5) T. Yano, P. Verma, Y. Saito, T. Ichimura, and S. Kawata, "Pressure-assisted tip-enhanced Raman imaging at a resolution of a few nanometers", Nature Photonics 3, 473 (2009). 6) H. Okamoto and K. Imura, “Near-field optical imaging of enhanced electric fields and plasmon waves in metal nanostructures”, Progress in Surface Science 84, 199 (2009). 7) Kaneta, T. Hashimoto, K. Nishimura, M. Funato, Y. Kawakami, “Visualization of the Local Carrier Dynamics in an InGaN Quantum Well Using Dual-Probe Scanning Near-Field Optical Microscopy”, Appl. Phys. Express, 3, 102102 (2010). 8) N. Tsumori, M. Takahashi, R. Kubota, T. Saiki, P. Regreny, and M. Gendry, “Near-Infrared Nano-Imaging Spectroscopy of Semiconductor Quantum Dots Using a Phase Change Mask Layer”, Appl. Phys. Lett. 100, 063111 (2012).